Are you or someone you know doing your leaving certificate exams this year? & do you attend any of these schools? …. Well we have a fantastic draw for you! 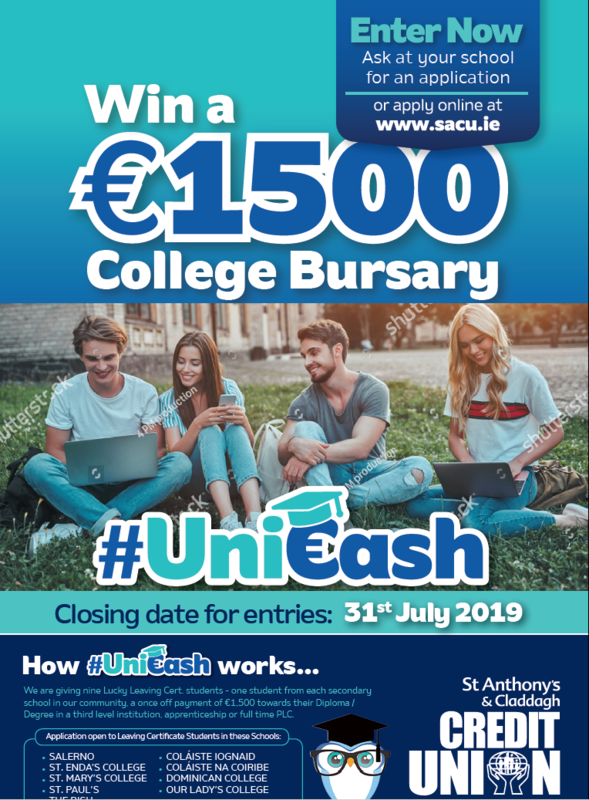 We are delighted to announce that our college bursary, #UniCash, is back & open for students who have completing their Leaving Certificate in 2019. We are giving away a grand total of €13,500 – that’s €1,500 each for 9 lucky students towards their Diploma/Degree in a third level institution, apprenticeship or full time PLC. One winner is guaranteed from each school. Applications for the draw can be completed online at www.sacu.ie/bursary-application or can be picked up in branch. The closing date for applications is 5pm on Wednesday 31st July 2019 so make sure to get your application in on time. Finalists will be picked and winners announced at our Student night in August. Don’t forget we also offer a great education loan, ‘Educate360’, that covers starting or returning to education. Parents or students can apply for this loan. The ‘Educate360’ loan is run in collaboration with St. Jarlath’s Credit Union with a low interest rate that covers all your student needs – from course fees, laptops, course material, accommodation fees & more. Call us on 1800 601 601 to enquire about your Educate360 loan today or click on educate360cu.ie for a quote & application. St. Anthony’s & Claddagh Credit Union is regulated by the Central bank of Ireland. Terms & Conditions apply.